January and February are relatively quiet months in the Sleeping Bear Dunes National Lakeshore, which attracts more than 1.7 million sandal-sporting tourists during the spring, summer and fall. 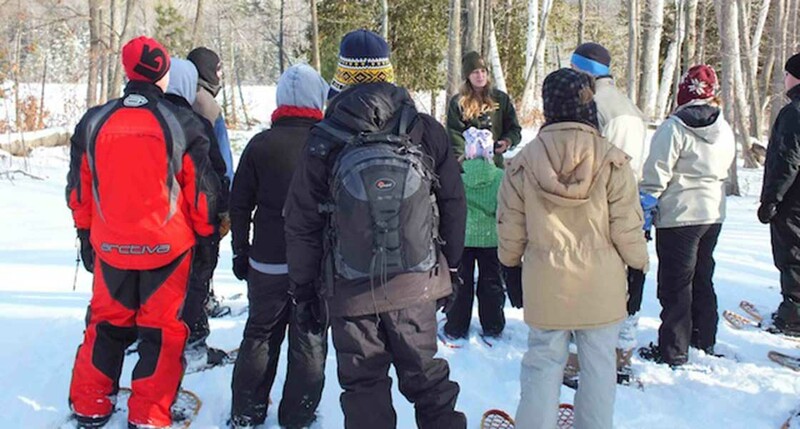 Nevertheless, up to 1,400 students from 25 area schools arrive in buses through the winter to join park ranger-led snowshoe hikes through the forests and sand dunes. Sleeping Bear's year-round staff of about 50 federal employees also schedules Saturday afternoon hikes. This activity typically generates enough weekend business to pack the Friendly Tavern in Empire with afternoon burger and beer patrons. It also helps Shipwreck Cafe owner Steve Nowicki sell enough sandwiches to stay open until spring. But the federal government shutdown has sidelined all of that. No school buses, no organized snowshoe hikes, and Nowicki says he now has unwelcome time to kill during what used to be the lunch rush. The Sleeping Bear Dunes National Lakeshore visitor center in Empire has been closed since the shutdown began on Dec. 23., staff members are furloughed, and planning and hiring for the busy months ahead have stopped. 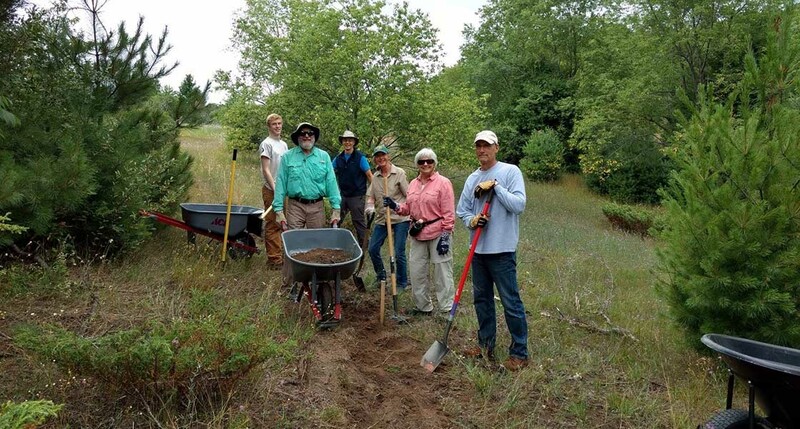 Fortunately, the park enjoys a healthy relationship with a nonprofit group of local volunteers, Friends of Sleeping Bear Dunes, which has pitched in to keep trails and parking lots plowed, collect trash and keep toilets clean and accessible. That’s in addition to the Friends’ yearlong project maintaining the popular Sleeping Bear Heritage Trail ‒ a 22-mile magnet for bikers, runners and skiers. The group signed an agreement with Sleeping Bear Dunes staff just prior to the shutdown to keep the park as open as possible for visitors, who are still allowed to navigate Sleeping Bear on their own. The volunteer group, which says it has about 600 financial supporters, includes many seasonal residents. 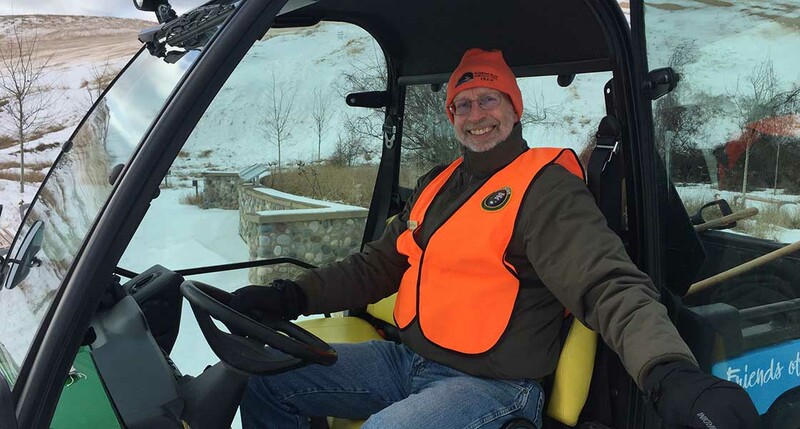 Leonard Marszalek, who managed the Sleeping Bear Heritage Trail until last fall, relocated to Empire after retiring from the Detroit RiverFront Conservancy. “The most gratifying feeling to me has been to see all the happiness, the smiles, the diversity, the enjoyment that people are having in using the trail,” he said of the work. 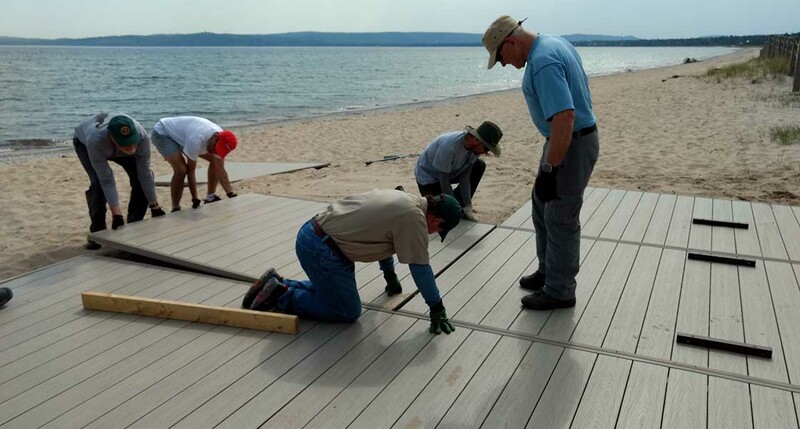 The Sleeping Bear effort is one of several undertaken by volunteer organizations across the country to preserve iconic national parks and limit waste and vandalism during the government shutdown, now more than a month old. They include cleanups at Joshua Tree National Park in California, where visitors have reportedly damaged some of the park’s namesake trees; to Rocky Mountain National Park in Colorado, where a Libertarian Party group organized weekend volunteers only to discover other good Samaritans had already cleaned public toilets and bagged litter along the trails, to a Muslim youth group that collected trash at Independence National Historical Park in Philadelphia. 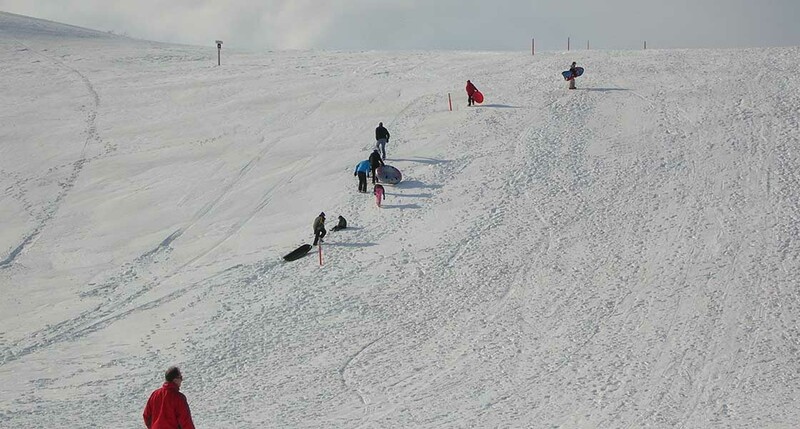 Sleeping Bear announced on Jan. 12 that it would use revenues from entrance fees to direct its staff to resume plowing parking lots and maintaining trash and toilets. 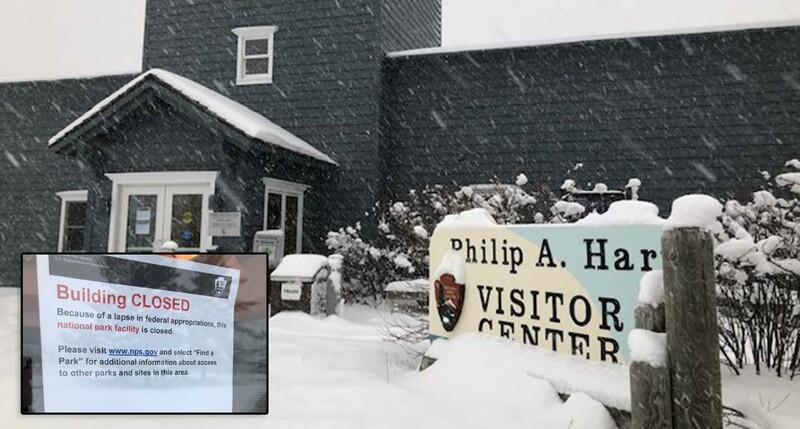 But the visitor's center—the gateway for many tourists to their Sleeping Bear Dunes experience—remains closed, and with it any snowshoe hikes or interpretive services. The Leelanau community has also rallied around Friends of Sleeping Bear. Cherry Republic, the gourmet gift company, held a chili dinner fundraiser for the nonprofit on Jan. 20 at its new brew pub in Glen Arbor. Kelly estimated that citizens raised approximately $500. While grateful for the community support, Kelly said he remains worried that, if the shutdown drags on, it could hurt project planning for the busy months ahead. The number of employees at Sleeping Bear Dunes balloons from 50 to as many as 200 during the warmer months, he said. In the meantime, Kelly laments that many public school students across northern Michigan won’t be given the chance to visit the park, take snowshoe hikes, or learn about nature and wildlife. The Friends of Sleeping Bear secured a grant from the National Park Foundation and the North Face Explore Fund to pay bus transportation costs to enable students to visit. The school program typically runs from mid-December until early March, but may be canceled entirely this year. “We need the government to reopen!” Kelly shouted over a biting wind howling through the dunes one recent day. And while he’s asking, Kelly said he’d like to do something about icy ski conditions along the trail. “We also need more snow!” he said. To learn more about opportunities for schools to arrange snowshoe hikes through Sleeping Bear dunes, click here. What will happen when people realize that a lot of what the government has done (without any authority), can be done better by motivated and dedicated citizens? A silver lining to this "shutdown" that isn't being widely reported yet? Is it being done better though? And is this model sustainable? I remember visiting the Old Post Office Tower in DC a few years back. The people from the NPS (gov't paid) couldn't answer the most basic questions the group I was traveling with had regarding the history or the features of the building. A docent (whom I later found out was only a volunteer and UNPAID at that) overheard our conversation and began to answer everyone's questions very enthusiastically for nearly a half hour. So, why would a group of dedicated volunteers be any less effective, Bones? The (now) Belle Isle Conservancy, the people running the T-Plex on Piquette or the people running the Gilmore out in K-Zoo seem to have everything well in hand. That makes entirely too much sense. You want people to be held accountable for their own actions instead of being forced to do it?? Honestly, I get agitated every time I see a story about the National Parks right now. People are complaining, saying it is dirty and covered in litter and that the government needs to reopen...instead of just cleaning up after themselves like respectful people should do. The media is NOT what it used to be. It is all #first, instead of delivering unbiased news with honesty and integrity. Sad. Obviously the people making the mess and destroying the parks are NOT the same people cleaning up after them. Kevin, also, this volunteer action is not sustainable for a long period of time. And to say that the people that normally work at the parks are not doing their job because others are destroying them and dirtying them in their absence is so ignorant. I live by one of the most beautiful places in the country, and those folks work long and hard to keep it that way and protect it. Nice try, Ellen, but that IS NOT what I said. And your statement regarding the sustainability doesn't hold any water either. I can very easily provide MANY more examples than the ones I posted above. Suggestion, break the National Parks, Seashores etc off into a separate GSE (government sponsored enterprise) so they can operate somewhat independently away from the congressional meddling and circus. Then do the same for the aviation and airports!